The most significant topographies of a vigorous lightening where they are recognized a real protection in a circular area confusions lightening. This is a new fangled generation of dynamic lightening conductor employed with the attitude of electrostatic field which can be observed the most operative lightening protection system and passablea lighting aptitude from single point ground. Entirely buildings ,exposed schools, hospitals, factoryedifice, base stations, fuel filling and sales stations, airports, stadiums, apartments, cottage sites, mosques, churches and synagogues of life, such as altogether buildings and facilities in the area. The functioning moralities encompassed transformation electrostatic grounds during thunderstorm mechanism on electric charge concerted in atmosphere clouds. We are manufacturer, exporter, supplier & trader wide range of Onay Plus Active Lightning Arrester. The most important features of active lightning, where they are established, an effective protection in a circular area hashes lightning. 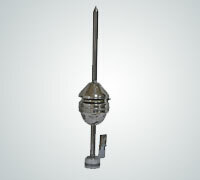 We also provide other make of lightning arrester, as per our customer's requirement. Dedicated Neutral & Body Earthing. To meet the precise needs of our customers, we offer the best quality of Conventional Lightning Arrester to our esteemed customers. 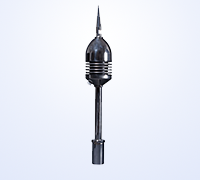 Designed as per the industry laid norms, the offered conventional lightning arrester is used to protect buildings or human life from damage caused by lighting strike. Owing to its adequate galvanization and highly electrical conductivity, the offered conventional lightning arrester is highly demanded. Solid Cu/gi Air Terminal Lightning Protection Spike Of 300mm Long, 25 Mm Dia Should Be Internally Assembled With 100 Mm Dia Copper Ball Fitted With Side Flash Protection Spikes With The Air Gap Technology. The Entair System Should Be Fixed With 2000 Mm Long Isolated Fiberglass-reinforced Plastic (frp) Mast. The Isolated Down conductor Internally Connects To The Air Terminal Inside The Frp. The Frp Mast Has Natural Isolation Properties, High Strength For Windy Sites And Low Weight To Minimize Mast Loading. We are Leading Manufacture and Supplier of ESE Lightning Protection System An advance technology lightning arrestor which ensure protection of your infrastructure and human life against lightning strike .Our advance lightning protection technology protects wider areas effectively as its ion accumulation technology enables it to grab lightning before it strikes to objects over very high virtual heights. Working principle: Advance lightning arrestor works on early streamer emission where it starts to emit accumulated charges to atmosphere before lightning strike to objects. it ensures protection over wide geographical space.